Alison Jacques Gallery is pleased to announce, An Unlikely Friendship: John Wesley in conversation with Donald Judd, the first in a series of exhibitions focusing on, close and often overlooked, friendships between seminal artists. Friends for over thirty-five years, Wesley stated that the two spoke about 'anything but art'1 and, although there was a clear admiration for Judd's work he 'wouldn't dare write about him'2. In contrast, Judd wrote several times in praise of Wesley's work and in 1982 he invited Wesley, on what would be the first of several visits, to spend time in Marfa making new work. Judd's vision of a permanent purpose-built John Wesley Gallery for his friend's work was always on the horizon but not realised in full until 2004 by the Chinati Foundation. Given the apparent disparity between John Wesley and Donald Judd's work, visitors are often surprised to find the John Wesley Gallery at Chinati and to discover the close friendship between the two artists. This exhibition brings together Wesley and Judd's work for the first time in direct dialogue with one another. A group of Wesley's painting on canvas and paper from 1983-1990 will be exhibited alongside four key Donald Judd sculptures from 1969-90. It becomes clear, from experiencing their work side by side, that the friendship was born from Judd's understanding of what Wesley was doing and an ability to relate to aspects within his own approach to making art. Judd's interest in Wesley's work arose in the 1960s, 'most of the best painting has got to the point where it is nearly flat and nearly without illusionistic space' but 'the most illusionistic of the best painting generally is the work by Lichtenstein, Wesley and especially Rosenquist - since they deal with subject matter'3. Judd was fascinated by the fact that in Wesley's work the spatial foreground and background shift back and forth enabling surfaces to be perceived on different levels. Judd considered this 'ambiguity' to be one of Wesley's main devices and admired the fact that not only the forms but the spaces between them could be perceived as forms in their own right which, in relation to one another, create a "coherent whole". 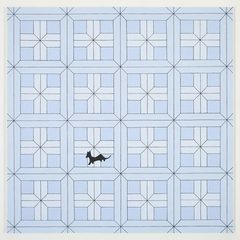 Although his work is predominantly figurative, Wesley plays with flatness and repetition to negate subject matter. Untitled (Birds) (1988) uses the repetition of a reduced bird-form so that it becomes a pattern on a recurring loop; almost like wallpaper. Judd describes Wesley's paintings as 'copies of the patterns of blue and white china. Most of the forms are nineteenth century. The forms selected and the shapes to which they are unobtrusively altered, the order used and the small details are humorous and goofy. This becomes a cool, psychological oddness.' 4 This 'coolness' and democratisation of form is seen in Judd's stack sculpture from 1990 composed of several wall-hung modules, forms favoured for their symbolic neutrality and industrial finish. Wesley's art also related to the aesthetics of mechanised production. Shortly after his move to New York in 1960, whilst working in the Post Office, he began to make paintings representing stylised versions of enlarged badges or stamps. He found images geared towards mass production through simplified form conveyed his message through an economy of means, which became the essential language of his paintings. John Wesley was born in Los Angeles and currently lives in Manhattan, New York (1928). His most recent museum retrospective was organised, curated by Germano Celant and organised by the Fondazione Prada (2009). In 2014, John Wesley was commissioned to create a public artwork for the High Line, New York. Donald Judd was born in Excelsior Springs, Missouri (1928); died New York (1994). His last solo museum show in his life time was The Whitney Museum of American Art, New York (1988). Numerous museum shows since his death include Tate, London (2004) and a forthcoming retrospective at the Museum of Modern Art, New York (2020). 1 Alanna Heiss, 'Conversations with John Wesley', in John Wesley: Paintings 1961-2000, (New York: P.S.1, 2000), p21. 2 Hannah Green, John Wesley, 'Donald Judd: Remembrances' Artforum, Summer (1994), p114. 3 Donald Judd, Complete Writings 1959-1975 (New York: Judd Foundation, 1975), p154. 4 Donald Judd, 'In the Galleries', Arts Magazine, April (1963).